England, 1945. A nighttime briefing of U.S. Army Air Forces personnel is in session, prepping the flight officers and enlisted men with details on target, weather conditions, aircraft, payload, and more. Just one thing remains. “Gentlemen,” begins the briefing officer, “the time on my command will be exactly 21:00 hours.” The men wait for the seconds hands on their government-issued A-11 watches to line up exactly with 12, and then pull out the crowns and set the time to 21:00. They wait for the command to proceed. “Hack!” says the briefing officer. The men simultaneously push in the crowns on their watches, all perfectly synchronized, to the second, to 21:00. Though numerous wristwatches were produced in the U.S. and issued to the military during World War II, the A-11 is perhaps the most iconic. With its legible black dial, white indices, nickel or silver case and one-piece strap, the A-11 has become synonymous with American horological prowess and industry, with tens of thousands made during the war for Allied soldiers. Early on during the conflict it was recognized that a modern military wristwatch that could stand up to the rigors of combat would be needed for issue to Allied personnel, which led to the development of the A-11 spec (the watch itself is generally also referred to as the A-11, though this is technically the name of the production standard; it will be used throughout this article to refer to the watch itself for simplicity’s sake). Prior to the official introduction of this spec, the watch that preceded the A-11 featured a white dial, but after 1942 this changed to black with white numerical indices. The spec also called for a hand-wound, hacking movement with center seconds, an outer minute track with 10-minute demarcations, and minute and hour hands. There was some leniency with the rest of the production standard, however, as some watches were produced with flat bezels, some with coin-edge bezels, some with waterproof cases, some with dustproof cases, etc. 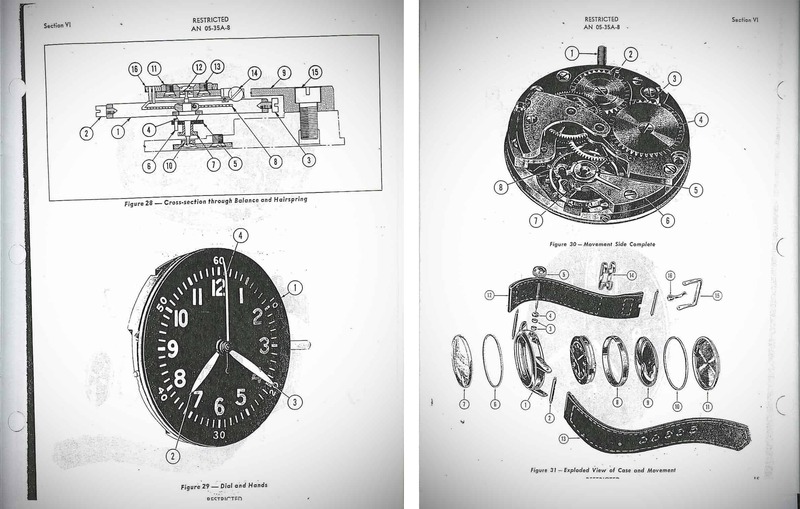 Both unlumed and lumed versions of the watch were produced, with the U.S. Navy Bureau of Aeronautics specially requesting a fully-lumed version, which was given the designation FSSC 88-W-800. 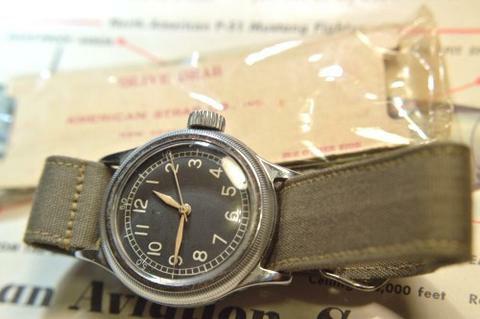 Three American watch manufacturers (Elgin, Waltham, and Bulova) were contracted to make the watches, though despite being an American production standard produced by American companies, the A-11 also saw service with the RAF (Royal Air Force) under the 6B/234 designation, the RCAF (Royal Canadian Air Force), and the Soviet Air Force. Two examples marked with the 6B/234 designation. Image source: MWR forum; user: Steve Z. The A-11 specification calls for the use of a minimum 15-jewel hacking movement, making the production guidelines more specific and stringent than those for the “Ordnance” watches outlined in the TM 9-1575 War Department Technical Manual for Wrist Watches, Pocket Watches, Stop Watches, And Clocks (these watches were produced for non-aviation personnel and can be found with many movement and dial variations produced by several American manufacturers). Because the spec also called for a center-seconds movement, most manufacturers seem to have begun with a 15-jewel sub-second movement (such as those featured in many of the “Ordnance” watches) and simply added a second hand pinion and extra jewel, bringing the total jewel count on these movements up to 16. All watches were also required to feature hacking (second hand stops completely upon pulling out the crown) for ease of synchronization and precise timing, and movements tended to be of high grade and quality, such as the Elgin 539 and the Bulova caliber 10AK CSH (the latter issued by the British as the Mark VIII). The cases used on the A-11 were generally chromium-plated brass (as steel was necessarily being relegated to wartime use), though because brass was also used for war production, occasionally silver was substituted, and some later dustproof versions featured an inner magnetic cover made of Invar, an iron-nickel-carbon-chromium alloy. 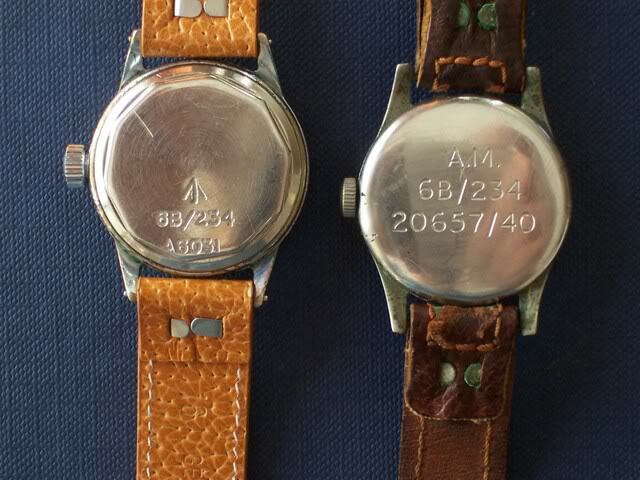 Spec markings on the stainless steel case backs included the service for which the watch was intended (generally “A.F. U.S. Army”), the type (A-11), spec number, serial number, manufacturer’s part number, ordnance number, and manufacturer’s name. Case dimensions on the A-11 are typically 32mm across (not including the crown), 39mm lug-to-lug, and 16mm between the lugs, which were drilled. According to the instruction handbook and parts catalog produced by the War Department for the A-11, straps were to be either one or two-piece canvas in olive drab color. Crowns were notched for easy grip and crystals were specified to be “unbreakable” acrylic. All in all this made for a simple, accurate, high-grade wristwatch that could stand up to the rigors of use in the field and be easily maintained and serviced. Though a 32mm case is tiny by today’s standards for a men’s watch, in the mid-1940s the A-11 was meant for use as a navigation timepiece, and many thousands indeed saw service as such during the war by USAAF crews. Because most were made of chromium-plated base metal such as brass and are currently over 70 years old, the plating on many of the cases has begun to wear off, and thus finding an A-11 with a case in good (let alone NOS) condition is proving more and more difficult. 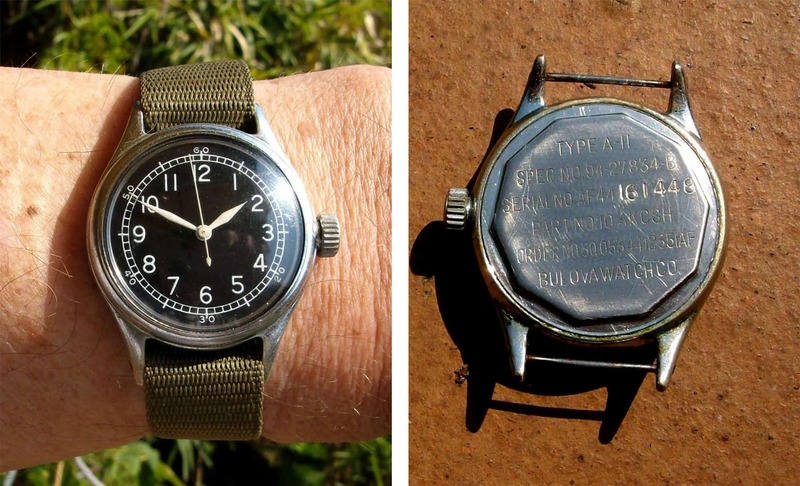 Many that appear on the secondary market today are also “frankenwatches,” as parts from A-11s, Ordnance watches and others were interchanged as necessary both by military maintenance personnel and personal watchmakers over the years. 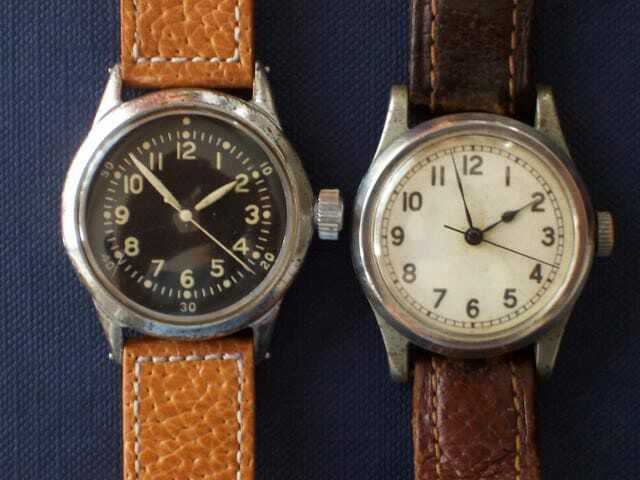 However, as of early 2018, an A-11 can still be had for several hundred dollars in good condition, making one either a great (albeit relatively small) entry into the world of military watches, a welcome addition to a growing collection, or, if nothing else, a useful, ticking piece of history left over from the Greatest Generation. In case you missed our past installments of Military Watches of the World, you can find parts 1 and 2 of our USA coverage here and here.